MSM coverage of events in Athens last night was lamentably slow, with Sky and the BBC sharing honours in putting BAFTA trivia ahead of a major European capital in flames. Then again, when a broadcaster like the BBC is in receipt of ££millions from the EU, perhaps the images of Athens ablaze is unhelpful? Of course in the end they HAD to show the scale and depth of public unrest but not without the repetition of this soundbite from Lucas Papademos ““Vandalism, violence and destruction have no place in a democratic country and won’t be tolerated”. I am surprised that the BBC were unable to find anyone who could point out that unelected technocrats imposing Germanic austerity against the will of the Greek people is not really “democracy” in the first place. 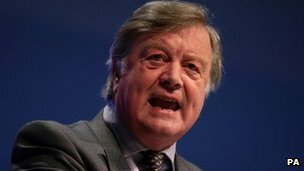 I see that the BBC has given Ken Clarke’s broadside to Cameron “not to seek to repatriate powers from the EU” great prominence this morning. They love Clarke, and Heseltine, and indeed all those other dripping wet C.I.N.O.’s who exist to perpetuate the gospel of the European Union uber alles.As the UK’s relationship with the EU is put under the microscope, the BBC seems determined to isolate the very notion that we take back some of the sovereignty drained away in recent times, and that is where Clarke and his ilk provide a very useful function. Douglas Carswell also gets the hectoring treatment this morning when he has the temerity to suggest that the British people must get to have a say on future EU treaty arrangements. Contrast the interruptions that characterise the Carswell interview with the studied silence that accompanies the evasive waffle from the foaming at the mouth Europhile Simon Hughes. That said, Carswell does his best although if you notice, Hughes actually gets to have the last word. Well it looks to me that the BBC is dismayed that Greek PM George Papandreou is still in office. For the last week or so they have been claiming that he would resign/lose the vote of confidence/walk away/be pushed. Naturally, they got that wrong and yet even after his victory in the Confidence vote last night, they are still pushing the idea he will yet fall and that their designated favourite, the Finance Minister Venizelos, will replace him a “Government of National Unity” – despite the fact the Nation is not allowed to speak to determine what the politicians should unite around! All the BBC glitterati were flown out o Athens for the vote …. from John Humphyrs to Stephen Nolan. It’s funny how the BBC choose not to pursue the validity of a Government ignoring the will of the people, yet I suppose when the aim of the BBC is to propagandise for the EU, maybe we should not be that surprised at this? Meant to cover this yesterday, I refer to BBC coverage of the latest European diktat bestowing additional rights and benefits on Agency workers. This has been presented by the BBC as a further instance of Euro benevolence and anyone arguing against it is treated as if they are the enemies if the enlightenment. It seems to have escaped the attention of BBC editors that legislation which puts extra pressure and cost on business in a recession will only lead to jobs being lost. On Today the other morning there was a harpy from the Trade Unions on bleating that this did not really go far enough but at least it was a step in the right direction. When the market adjusts for this imposition, and fewer agency workers are employed, the BBC will then bleat about the awful unemployment. This is how the BBC operates its pro-EU policy; it cheer-leads for the legislation from Brussels and then attacks the Government when the inevitable chaos ensues. A LITTLE PROBLEM IN GERMANY…. violating its treaty mandate with the mass purchase of southern European bonds. But the BBC seems less than intrigued by these MAJOR issues. I suppose it’s own pro-EU enthusiasm immunises it from having to analyse the rising voices in Germany who seem no longer prepared to go along with what Merkel and co have been doing, so it simply blanks this as a non-story and instead elevates attacks on the Murdoch empire as being the more important. In this way it debases its own integrity, a point that Mark Thompson might do well to reflect upon. Well then, the BBC has a problem. Despite Obama’s heroic raising of the Debt Ceiling and despite the best efforts of our wise rulers in the EU, financial markets decided yesterday that they no longer can trust the hollow promises from Washington and Brussels.Markets are in free fall – how to deal with? Well, this morning they wheeled on that old fraud Romani Prodi to try and explain things. He was dreadful and despite softball questions I imagine his comments will probably have further spooked markets. Next up was Olli Rehn, given a big drum roll by the BBC. He was only marginally better than Prodi and I think even the BBC were a bit rattled that their preferred snakeoil salesmen no longer even sound slick. That said, I suspect that the subtle agenda the BBC are getting behind is that the solution to EU failure is….MORE EU. The central planners in Brussels seek to use this crisis to further the design for complete control over the remnant of the Nation States within the EU bowl and you can be certain the BBC will do everything possible to help advance it. The BBC has done everything possible to relegate focus on the ongoing meltdown of their beloved eurozone but they are quick out of the traps this morning to join in the faux celebration now that the “leaders” have come up with a brand new package that solves all fiscal problems. I was entertained by this interview with Sir John Gieve, former deputy governor of the Bank of England, as he considers whether changes to the European Financial Stability Facility (EFSF) will prevent further crises. Sir John, a mild mannered chap, had the temerity to suggest that this is a short term fix that may not solve the problems that afflict Greece et al. Sarah Montague instantly suggests he is being “negative” ensuring he instantly puts a more positive spin on the ludicrous antics of Merkel, Sarkozy and co. It is perfectly obvious that a Nation mired in debt will not recover from such debt be giving it even more debt and yet this is the big idea of the Eurocrats keep pushing and the BBC keeps propagandising. ENDA ON AN AUSTERITY BENDA? LOVING EU HAS MADE MY LIFE SO BEAUTIFUL…. With apologies to the late Minne Ripperton! The Boiling Frog spotted an excellent example of the BBC eulogising the wonders of the EU here. Prominent on BBC News earlier today was a report that Dutch airline KLM is refusing to pay out compensation to its passengers delayed by the volcanic ash cloud earlier this year. And throughout the report the BBC just couldn’t stop mentioning the EU. It was liberally sprinkled with phrases such as; “protected by EU rules”, “under EU rules passengers are entitled to compensation”, “the EU Commission promises to get tough” and so on. The obligatory ‘financially hit family’ were featured, who were facing poor treatment from the airline. The tone of the report was very clear; nasty airlines, but at least the nice EU is on your side. They even interviewed a European Commission spokesman in front of the Berlaymont which must be a first (The BBC do know where it is then? ), but no-one from the airline was interviewed or any hint that the airlines were grounded because of an EU decision in first place. Influential public relations agency BBC EU PR has just produced a puff piece for one of its top clients. Update 16.20 – just noticed that Roland Deschain mentioned this on the open thread earlier, so tip of the hat to him. Beeb Bias Craig spotted it before me too. Comments on this thread in haiku please. Starting from… now. So, cor blimey Brit – Akma Shaikh, faces execution by the Chinese for his conviction of 4kg of heroin being found in his possession in the remote north-western city of Urumqi in 2007. I find it curious that the BBC goes on to state that Shaikh will be “the first EU national” to be executed in China. Does the BBC now view us all as “EU nationals” first and foremost?